The Crochet Ribbed Color Block Cowl is the perfect project to get ready for Spring! For details on how to make this project, check out the free pattern below as well as the video tutorial below! The ad-free version of this pattern is available for purchase here. Hello and welcome back to my blog! 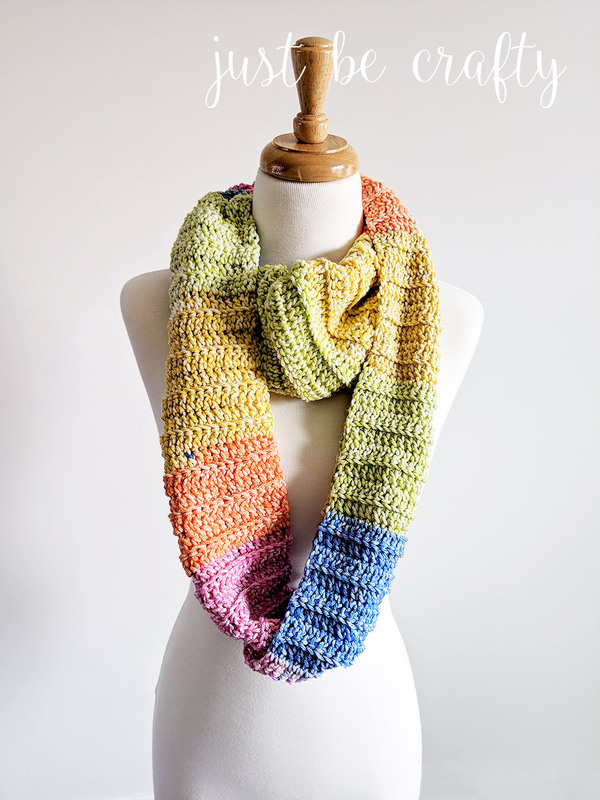 Today I am sharing a fun new pattern – the Crochet Ribbed Color Block Cowl! Spring is here finally… but still not quite yet into full bloom. 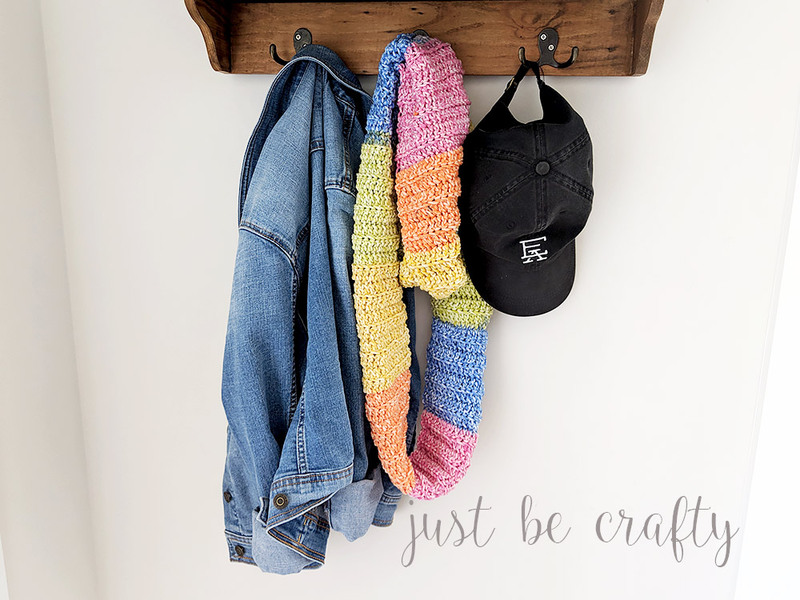 To assist in speeding up the colorful Springtime I’m craving I wanted to make a project that was bright, light, airy, and still a tad bit warm… thus the Crochet Ribbed Color Block Cowl was born! 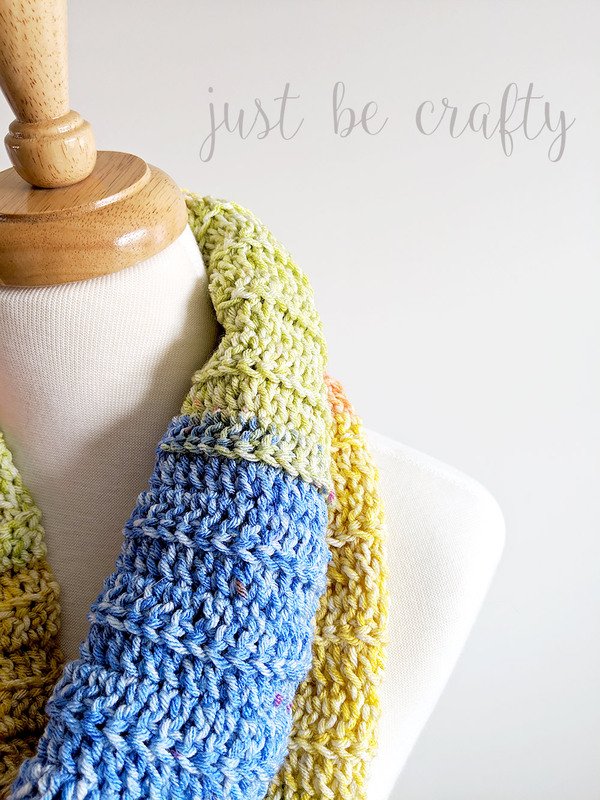 The yarn used in this project is Hobby Lobby’s Yarn Bee Soft & Sleek Low-Pill Fiber yarn. I love this yarn for its smoothness and softness which yields a lovely drape for the finished piece. The colorway selected for this project is made up of multiple bright colors that create a beautiful striping effect. I have to say that I LOVE self striping yarn because you get a colorful finished piece automatically PLUS you don’t have to weave in any ends! Is there anything better?! The stitch used in this project is simply double crochets made into the back loops of all stitches. Crocheting into the back loops of the stitches creates a fabric produces a stretchy ribbing. Using double crochets for the ribbing produces a chunkier ribbing without adding the bulk, not to mention the project works up pretty quickly. 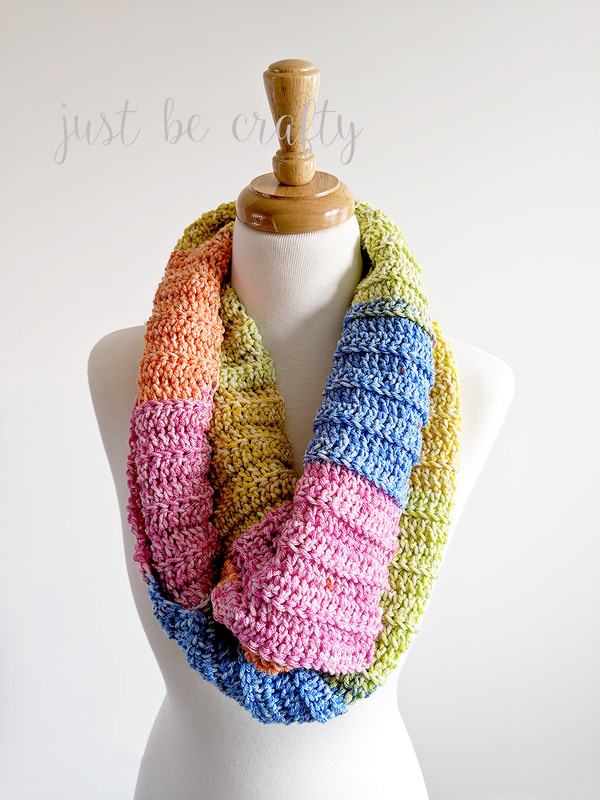 To rock the Crochet Color Block Ribbed Cowl, I suggest looping around your neck twice! Looping twice will give the cowl a nice volume without any added bulkiness. 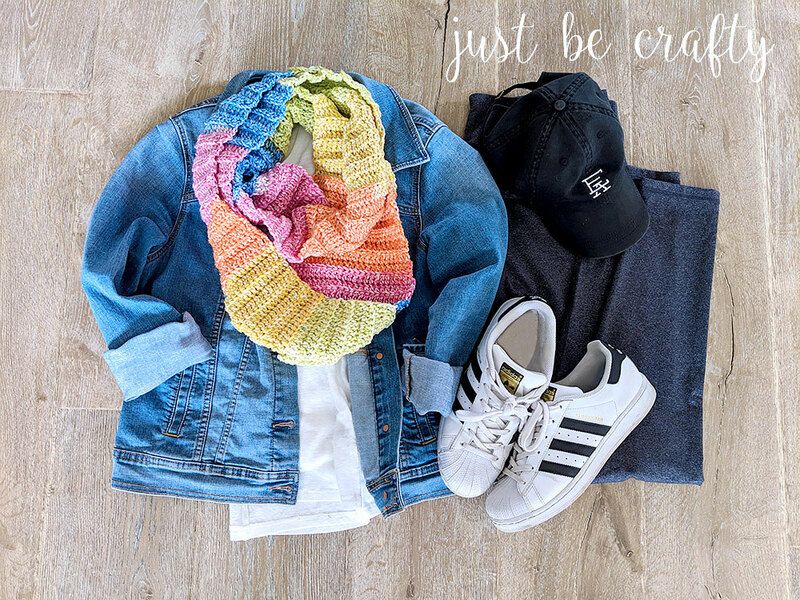 Pair with a basic white tee and denim jacket for a casual look. See photo below for inspiration on how to complete the look! Once you have mastered the above skills, you are ready to tackle this pattern! For the written pattern keep on scrolling below! The ad-free version of this pattern is available for purchase here. 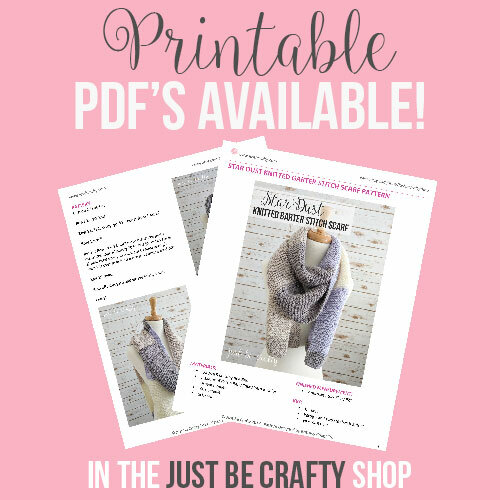 See this post here to access your FREE Crochet Terms Most Commonly Used cheat sheet download! NOTE: The 1st dc of each row will go into second stitch as the starting chain 3 will count as the 1st stitch. Also, all stitches will be worked in the back loops only. Repeat Row 2 until you have used up both balls of yarn, ended at your desired length, OR ended at your preferred color sequence (mine ended up being about 64 inches long) – making sure you have enough yarn left over to slip stitch the ends together. Allow color changes to occur naturally as you go. Note that color changes will most likely occur mid row and will not have a clean start at the beginning or end of each row. I liked this look and used this method for my cowl. This method also means less ends to weave in! If you would like to control your color changes, I suggest to crochet up until you can complete as many full rows as you can with one color, cut yarn, and join in the next color on the following new row. Both methods will yield beautiful results! Lay your piece flat with the side you choose to be the front face up. Fold in half so that the starting end and finished ends are touching. The right side of your work should be inside, and wrong side should now be facing you. Line up the stitches from starting and finishing ends together. To start join, ch 1; sl st the ends together by inserting your hook into each st through both layers across. Once you sl st across row, cut yarn and secure. « Circle To Square Granny Square – New Video Tutorial!